Flax Hull Lignans serve a whole host of potential health benefits. For instance‚ research suggests that flax hull lignans can be a great source of dietary fiber since they're derived from flaxseeds. The fiber in question is present in the coating of the seed and could potentially curb appetite. There is also some speculation and studies that suggests flax hull lignans may potentially have positive benefits for cardiovascular health. Specifically‚ it's possible that Progressive Labs' flaxseed supplement may cause certain cells in our blood to be less inclined to clotting. Flax Hull Lignans are also a source of omega-3 fatty acids. These essential fatty acids are said to possibly have anti-inflammatory effects throughout our body. The omega-3 fatty acid featured in flaxseeds is ALA (alpha-Linolenic acid)‚ a precursor to EPA (Eicosapentaenoic acid) and DHA (Docosahexaenoic acid)‚ other essential omega-3 fatty acids that our bodies could potentially synthesize from ALA. 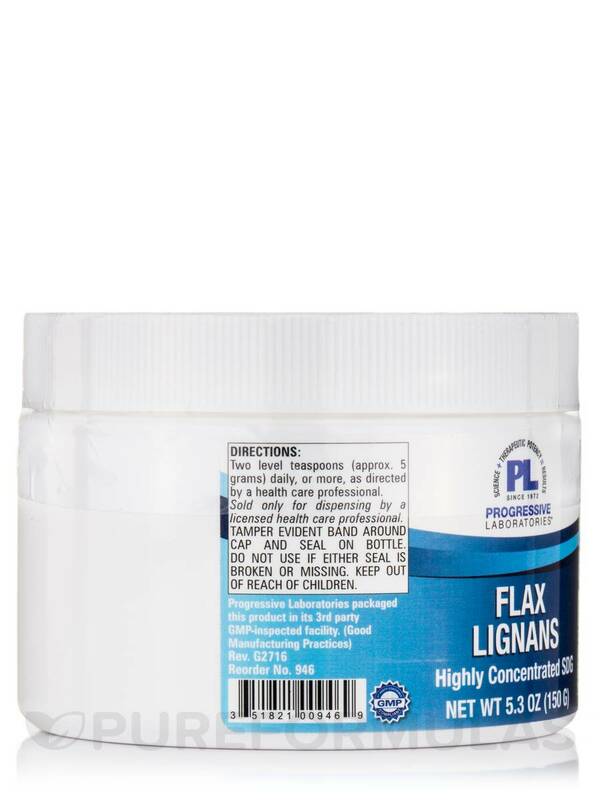 Using a flax hull lignans supplement like Progressive Labs' could also possibly help with certain gastrointestinal issues like chronic constipation‚ diarrhea‚ large and small intestine inflammation‚ and possibly more. 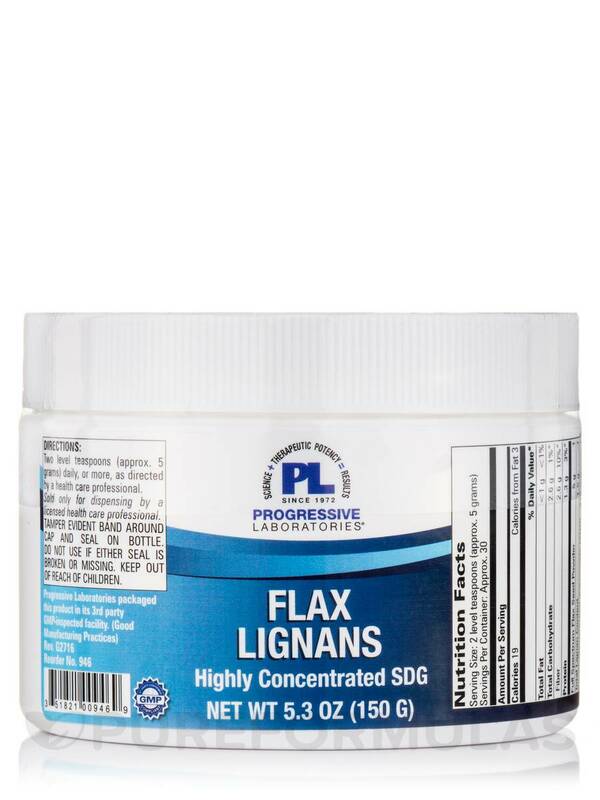 Progressive Labs' Flax Hull Lignans also contains SDG (secoisolariciresinol diglycoside)‚ a chemical compound generally found in plants and seeds that could exhibit certain antioxidant properties. Antioxidants are substances that target and eliminate free radicals in our bodies. Free radicals is the term used for atoms in our bodies that have an unpaired electron. This means that these free radicals could potentially pose a risk to our health. The recommended dosage for Flax Hull Lignans is a single teaspoon (5 gm) a day; however the dosage could also depend on your healthcare practitioners directions. 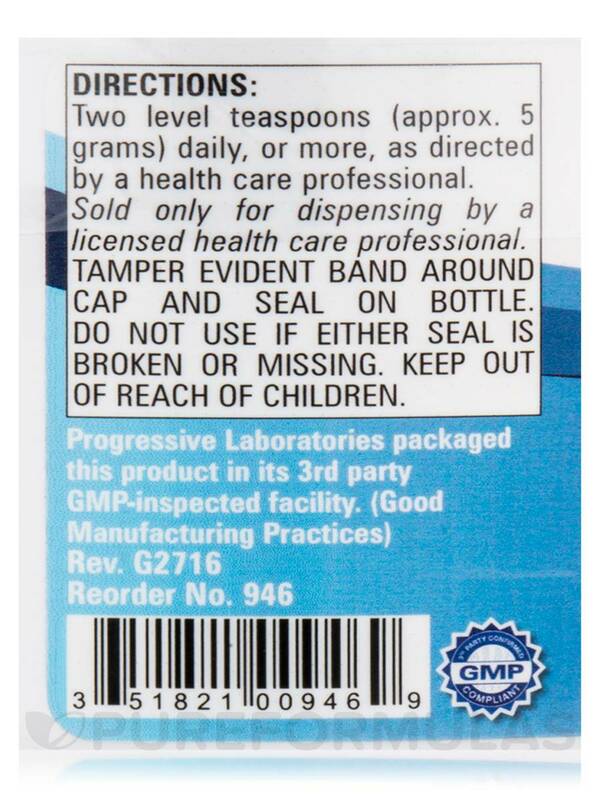 Progressive Laboratories packaged this product in its 3rd party GMP-inspected facility. (Good Manufacturing Practices). Two level teaspoons (approx. 5 grams) daily‚ or more‚ as directed by a healthcare professional. I join the health sciences institute, and had ordered there books on miracle from the vault, about cures using natural herbs and such. 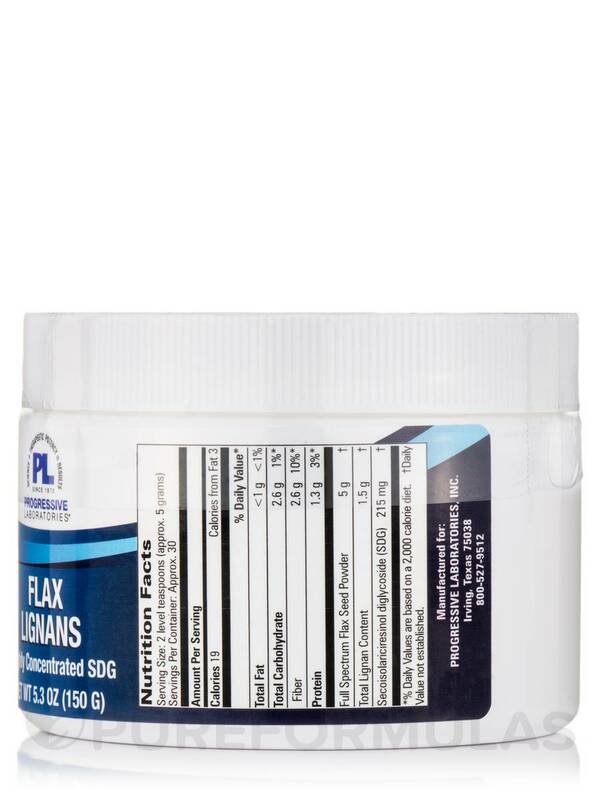 There is where I found out about your product Flax Hull Lignans by Progressive Labs. The reason I am taking it is cause I have cancer in which I had an operation. I strongly believe in natural products for they don't have side effects. I do intend to order more when I am just about out of it. I am taking it twice a day morning time and evening time. I am also recommending this product to by brother who has cancer also and he as been taking kemo which gets him very tired. Thanks again for this great product and I strongly believe its works for I am starting to feel a lot better. Again THANKS! It's great....I give it a 10 strongly believe. I was using flax seed powder for some time. While it did not have a negative impact on my health it would be difficult to pinpoint the benefits. However when I started using the FHL my digestive process has changed. Im now regular in a way that is astonishing. Love this product. What is the nominal mg content of SDG per serving of Progressive LAB HuULL LIGNAN? Hello, thank you for conatacting PureFormulas. 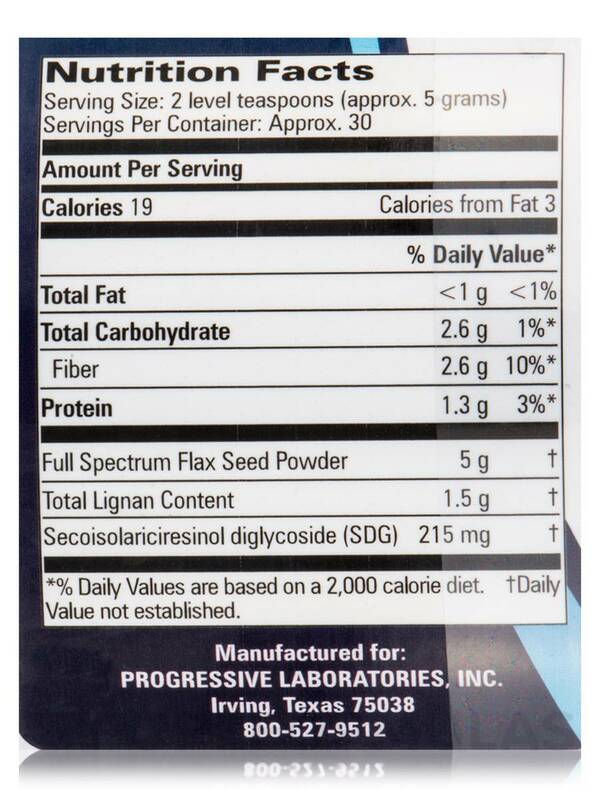 the total Lignan content this product contains is 1.5 grams per serving.